Place frozen blueberries in a 9-inch pie plate. If using fresh blueberries, wash and drain before placing in a 9-inch pie plate. In a small bowl, use a fork to mix margarine, flour, sugar, oats and cinnamon. 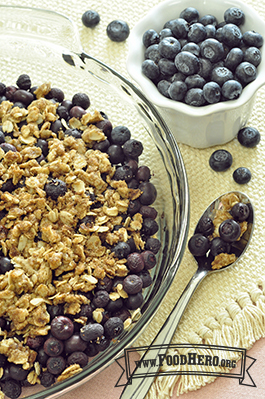 Sprinkle oat mixture over the blueberries. Bake for about 25 minutes. Enjoy while warm! 2 Comments for "Blueberry Bling"
People love this recipe. This summer,my family has had large amounts of ripe apricots, nectarines and blackberries given to us. I used all of these fruits in this recipe and it came out great. A few weeks ago, I made a large pan of this recipe with blackberries to share with my co-workers; there was not a bit left--much to my kids' disappointment. At home, we will often eat it cold for breakfast or dessert with a dollop of yogurt on top.